Thought id join in and show what i have been using my Xcarve for. I have had this out of the beta stage for 6 months and it currently runs for 1/2 day every business day. It took a year to figure out how to get it to the point where I am now and do not need the items in hand to make the inlay. I do this only on the internet. Those are awesome! Very nice job. Very Nice. If you don't mind my asking. What type of foam is that in the pictures? It looks to be much more dense than the foam in my Pelican cases. I might need to replace it. 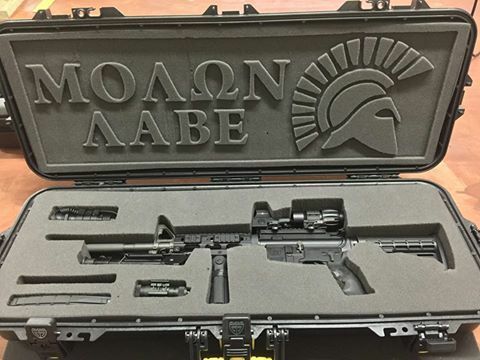 I invented a soy based gun case foam that I manufacturer that is 2x as firm as the pelican foam and super duper light weight. It's the only millable polyurethane foam rubber that can keep an edge and not tear when it's cut. If you are interested, I'll give you the specs on how to cut it. That foam looks like something I need. I looked at your web site and the prices are very reasonable! How stiff is the foam? If I crush it with my fingers will it spring back or hold the new shape? That is really awesome! Just curious, how do you go about getting a good profile of the gun and optics? Also, if you could share your bit and feed rates that would be great! What I could do with my guitar case.......Have you used a laser to cut it yet? Thats really cool. I would love the cutting specs. The cost is really good as well. I see a lot of case upgrades in the near future. The foam is much firmer than what you would find stock in a case. Yes, if you pinch it very hard, it will crush. That's the nature of foam, But spring back is slower than your avg. couch cushion spring back. So it will slowly come back to size. But it will come back to size! This helps out with temporary placement and eventually permanent placement.So as far as your last questions, it depends on how long the item has been comporessed in the foam. I cut everything from a picture. I get an aerial picture of the item, Bring it into illustrator and with the pen tool outline the item. Then i scale it according to the actual item. So if a rifle is 39.5 tip to tip, I make a line that is 39.45 ( slightly smaller ) and scale the outline to the line. Then into Vcarve pro i go! I have a 4 inch shank Straight plunge 2 flute bit 1/2 inch thick and run it fully in the foam to depth. So one pass. 30 Feed rate and i have an manually adjustable router attached to the xcarve. I adjust the bit to its max speed. the trick is to cut it conventional in a raster direction. Happy to facetime and walk you threw your first cut. The foam is a bit tricky, and act a lot different than wood. It does have give, so if you find it pushing the foam around, but it is not moving the entire piece, you need to increase your speed and decrease your feed. Happy to walk you threw your first step up via facetime. I say away from heat, any poly foam will release a toxic gas that will knock you on your behind. It is really nasty and may cause ovarian cancer in men. I don't find cutting all the way thru is the way to go, when i can cut to depth. So i haven't experimented with lazers. Altho i got really excited when i saw you can buy a kit OF FREAKIN LAZER BEAMS. Heres some pics of my battlestation! This looks like something I could get behind. Seems like I'm buying some foam in the future. A video of you actually cutting a project out would be interesting to see. Would love to learn how it's cut. Now that is absolutely fantastic. Any gun owner would be proud to display this inside of his case. I know I would. Thanks! it's the best I could do with sheet metal. its 1 inch thick which sometimes gets in the way, but the hole where the bit goes into is big enough for the chuck, so I get a little more clearance. Happy to help, I'll work on a video, but it will take some time.